What's new with the nano? Apple has updated the iPod nano for the fourth time. 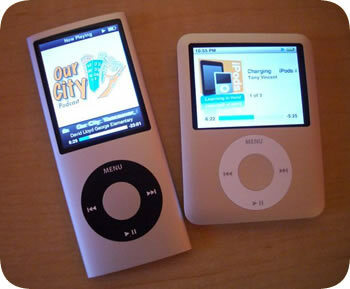 The new "4th generation" iPod nano has more similarities than differences from the 3rd generation iPod it is replacing. The most noticeable difference is that the screen is taller and skinnier. However, the screen is the same one from the 3rd generation nano, only turned 90 degrees. Apple doubled the storage capacity at the same price points as the previous nano. That means for $150 you can now get an 8GB nano. For most everyone, that's plenty of memory. Eight gigabytes will hold hours of video and days of audio. Like all iPods with click wheels, you can enable disk use for transporting, storing, and backing up computer files to that 8GB of memory. The nano knows which way it is being held and will sometimes change what's on the screen to match how you're holding the it. That's because Apple added an accelerometer to iPod nano. But it only works in certain functions like playing videos, browsing audio, and viewing photos. Some games require that you hold the nano sideways in order to play. And speaking of games, I'm really sad that the iQuiz game no longer comes preinstalled on the 4th generation nano. While you can purchase iQuiz for 99 cents, it will not run on the 4th generation nano. I really hope iQuiz is updated to work on the new nano because it is a great quizzing game and makes the iPod a more useful study tool. The new nano supports recording with an external microphone. It can use microphones that connect to the headphone jack (like the microphones that come with iPhones). It can also record using external microphones that connect to the dock connector like the Belkin TuneTalk. 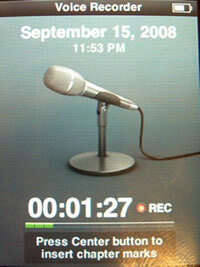 The Voice Recorder function is updated and Apple added the ability to add chapters while recording. This is super handy when recordings are long. Another change is that the iPod no longer records in the WAV format. Now it uses Apple Lossless format. While it is similar to WAV, it is not nearly as compatible. You might have to use iTunes to convert recordings to more compatible formats like WAV or MP3 if you're importing into other programs like Audacity. Apple software like GarageBand can certainly use the Apple Lossless format with no problems. Other than the lack of iQuiz, I really like the new nano. In fact, I would recommend the 8GB nano over the 120GB iPod classic. The only major differences are the storage capacity and screen size. The classic has a slightly larger screen, though that screen has the same resolution as the nano's. Unless you need to carry around an enormous number of videos or need lots of space for disk use, the nano is going to meet your needs for $100 less than the classic.